Investing in a drone is a big decision and today we are going to discuss why a freelance cinematographer should own one. Ten years ago, no one ever thought that they could have a flying camera. Freelance filmmakers thought that only huge Hollywood production companies could capture footage from the sky. That’s not the case anymore! We are now in a different era where the growth of technology is constantly spiking. What does this mean for today’s filmmakers? Today’s filmmakers no longer have to dream about capturing beautiful aerial footage! We can now do it ourselves without relying on huge film crews or massive spending. The drone era is here and it is going to change your filmmaking business drastically! So why should you own a drone? Drones provide a bird’s eye perspective of the world. By incorporating a bird’s eye view to your videos, you add creativity, production value, and another perspective. The truth is that people are getting used to seeing everything from the ground. Wedding videos, real-estate videos, promo videos, no longer have to be shot from just one generic viewpoint! However, there is a catch; owning a drone does not mean that you are instantly going to capture amazing footage. It takes practice. However, DJI has made flying a drone very easy, using their new Phantom 4 which uses artificial intelligence and advanced flight modes, that allow novice flyers to easily get the footage they want. Drones can also expand your filmmaking business into different ventures. An average filmmaker’s equipment includes a DSLR camera, tripod, slider, and lighting gear. But, when you get a drone, you can add much more to your repertoire of work. For example, you can film water sports, rock-climbing events, zip lining, and just about anything you can think of that a traditional camera cannot film. Do you really want to miss out on all of that opportunity? By increasing your project ranges, you are going to get more work AND you will make more money! Now let’s talk about what you need to buy alongside your drone. Always consider buying a few batteries and chargers. One of your projects might be in an area where there are no power outlets, so you must be ready for this. A case or backpack is also strongly recommended. 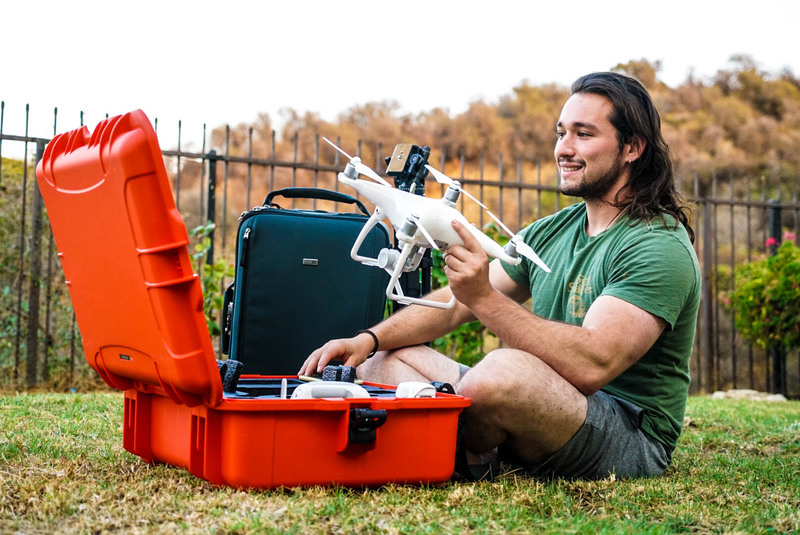 Protect your drone with the right gear! Drones are the future and today’s filmmakers need to take advantage of what these machines can do. It is time to transform the way you film! i am happy to join this website,especial all tutorials from youtube.. sure i’m going to learn better about filmmaking. What DJI drone do you use and recommend? I’ll sometimes want portability…but I definitely like the higher 4K speed available on the Phantom 4 Pro (to convert to slo-mo in post). Which do you use the most? And then there’s the upcoming Phantom 5 Pro. Would love to hear your thoughts. Thank you for pointing out that drones provide a birds-eye view of the world. This seems like an amazing way to get breathe taking footage. Hopefully, people wanting to get any footage like this look into getting the best drones possible.